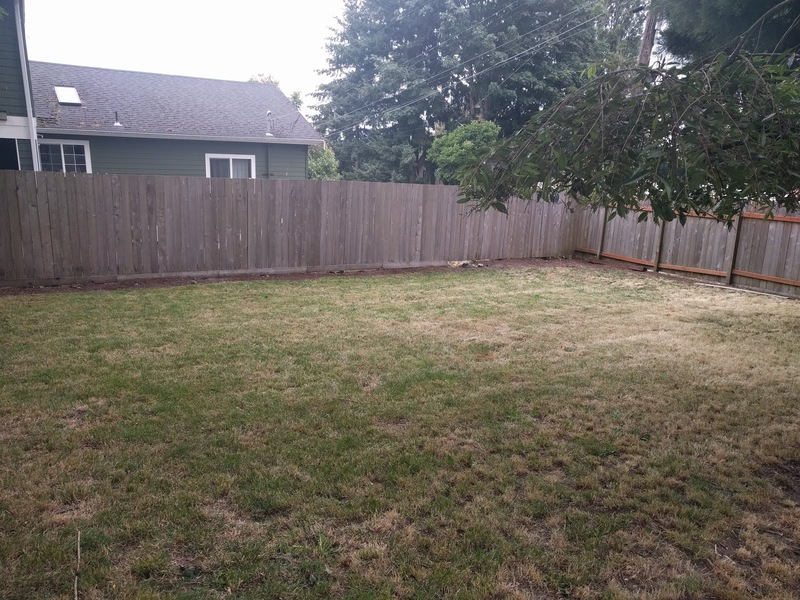 Our yard has been embarrassingly overgrown for the past couple years, though I have tried to at least weed a flowerbed or two each summer or trim some bushes here and there. 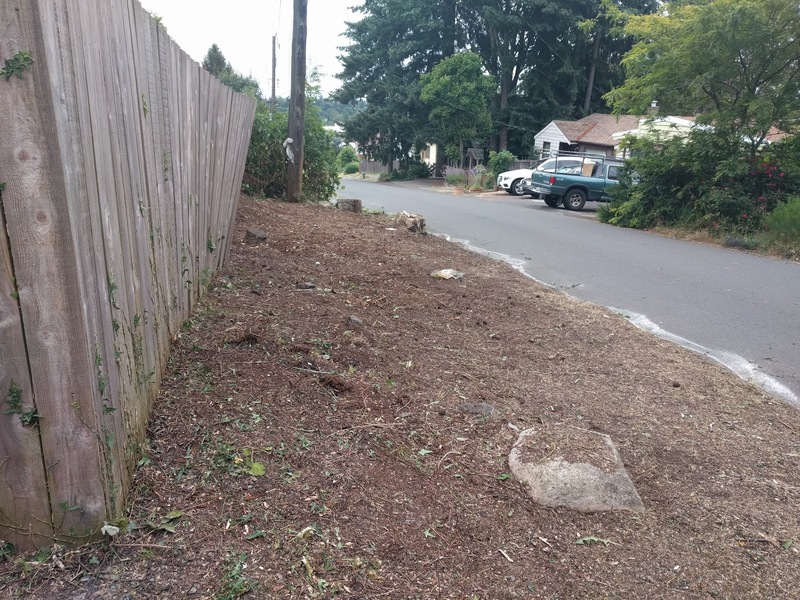 The side of our fence near the road was becoming a jungle of blackberries and ferns that was taller than the fence and was making backing out of our driveway dangerous due to limited visibility. I'd realized last summer that I could spend hours trying to hand clear some of it and it wouldn't look like I'd done anything. So this year I contacted a landscaping place and paid them to come out and do a yard cleanup. Gareth was disappointed that his source of staffs was removed (bamboo) and Mal kept yelling at us for "destroying all the nature". This first picture shows where the bamboo used to be (along the fence around that tree). Don't ever be stupid enough to put in bamboo. It cost almost $400 to have a tiny patch of two clumps cleared (am I ever glad we didn't buy the house where the bamboo had spread through the whole yard!). 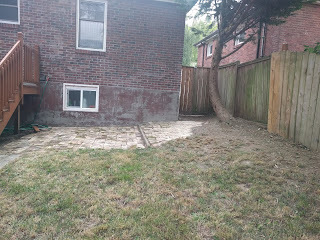 We're going to get the tree removed as well as it's too close to the house/too big for the space, but we're waiting on a city permit for another tree removal before the arborists come take care of that. The lawn is patchy and almost dead from lack of rain, but they cleared up all the weeds around the edges, mowed, and edged the lawn nicely. This is where the jungle was. You can see some jungle remnant by the telephone pole (they didn't clear that as it is on our neighbor's property - our neighbors have since cut that bit back a little). We just had them ground clear it, so it will come back. But we're going to get it sprayed as well to help slow regrowth. One day we'll figure out what we want to do with this space, but until then I'm just hoping to keep on top of the regrowth. They also mowed and edged the front yard and trimmed all the bushes - it actually looks like someone lives in our house now rather than looking abandoned! The tree we're waiting on the permit to remove is a birch that's in the front yard. It's being killed by birch beetle, so needs to come down. It was once a lovely tree, so I'm sad it has to go, but it lost a really large branch this fall in a storm, and I'm not wanting to wait until a big enough chunk falls off and damages the house to get it taken care of. We'll work on figuring out an alternative shade tree to plant in its place eventually. I'm spending a few weeks commuting over to the east side. This is a time drain and is helping me realize that such a commute would not be tenable for me long-term. But it's only for 3 weeks. 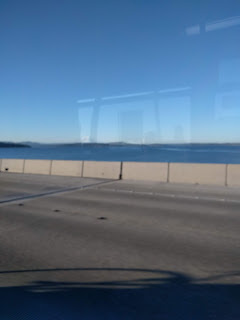 At least there are some nice views along the way as the bus crosses over Lake Washington and sometimes you can see Mt. 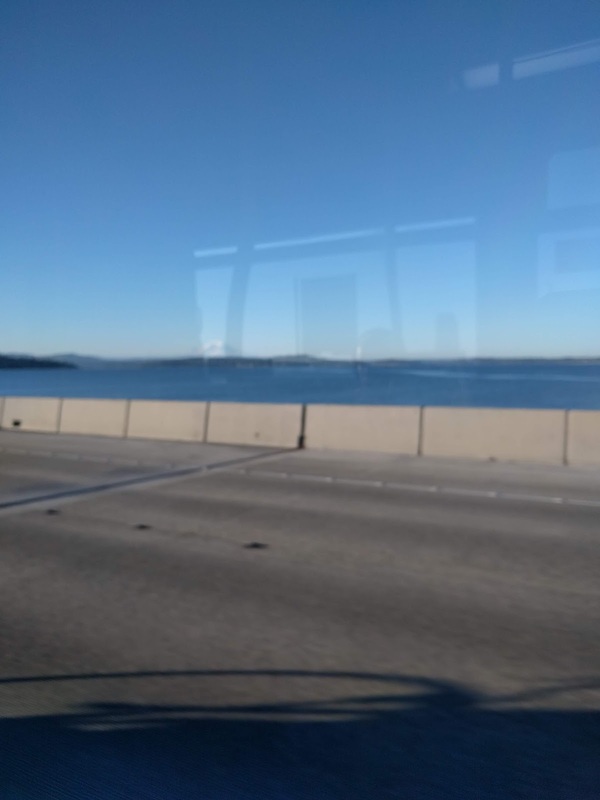 Rainier (hidden by the bus window glare here). I discovered that a friend who used to play in clarinet choir with me works at the clinic I'm at right now. She had told me what clinic she was at (she's a pediatrician) before, but I'd forgotten, so it was a pleasant surprise to run into her the other day! She went to Purdue for her undergrad and played in the same community band I played in while we lived out there. I'm about the same age as her daughter, so she calls me her second daughter; I really miss having her in clarinet choir, so I appreciate anytime I get to see her. After this rotation is over, just three weeks of food service (back at Children's again!) and then graduation! It's been an intense couple years, but so worthwhile and I've loved my time in this program. It's always a little rough to be staring down the black hole of the unknown after graduation. I'm just hoping there are some clinical jobs with a decent commute available when I've passed the RD exam and start looking! Congratulations on reaching the end of your graduate degree! It is hard to balance children and grad school, so good for you for doing hard things!